Don't keep breaking your resolutions - Power Your Mind to finally achieve your dreams and resolutions successfully with Hypnotherapy!!! 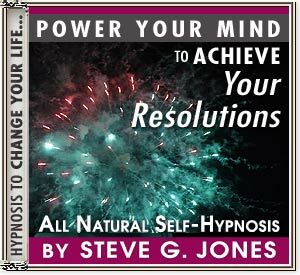 Power Your Mind naturally with Hypnosis to achieve those resolutions instead of breaking them! YOUR SUBCONSCIOUS MIND HOLDS THE KEY TO FINALLY ACHIEVING YOUR RESOLUTIONS! We ALL have things we'd like to change or achieve, and many of us naturally take the next step by making "resolutions". But sometimes, then, we go no further. Even if it's something we truly, dearly want. Sometimes, our minds just don't seem to equate those resolutions with real plans, and so: we give up or fail to follow through. Our Power Your Mind to Achieve Your Resolutions CD (or MP3) can help you to create the missing links in the process and change all of that entirely!!! POWER YOUR MIND to not ONLY make those resolutions but to retain your enthusiasm and the motivation to follow through! Why wait until New Year's Day to make your resolutions? Do what you want to do! Be what you want to be! You CAN change or achieve what you want - NOW!